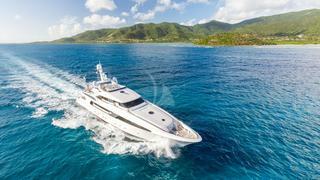 Charter yacht USHER yacht has a proven track record. Remarkable speed and agility combined with sophisticated style make this high-performance semi-displacement motor yacht the obvious choice. 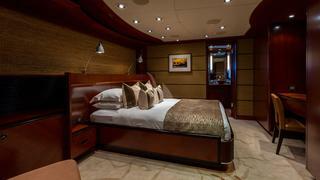 Her interior invokes a sense of leisure, relaxation and adventure. 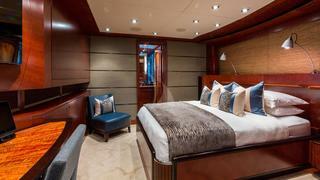 Open, light and airy, many of the rooms on board motor yacht USHER function as works of art themselves. Five spacious tech-savvy cabins, complete with iPads, sleep 12 guests; she has an additional third Pullman berth well suited for a child. An elevator services all interior decks. 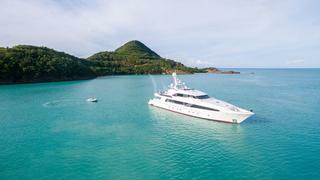 Zero Speed stabilizers, an array of water toys and iPad-controlled A/V systems in each room are just a few reasons to charter M/Y USHER — she's at the top of the game. The hand-carved floral inlay carpet and fine upholstery evidence the fun, colorful essence of this vessel and her bamboo, woven wood, leather hides and textured fabric showcase her transcendent, simplistic nature. 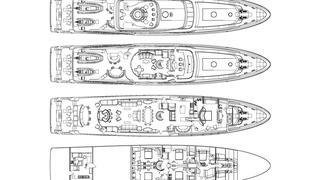 A hallmark of this superyacht is her elegant woodwork, which spans the interior and includes African walnut flooring and Bubinga ceiling beams. 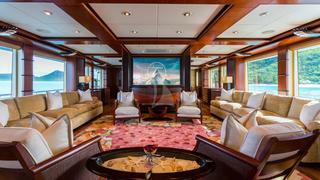 After an extensive refit in June 2014, which included a full paint job, the addition of Savant Sound A/V equipment, new flat screen televisions throughout the vessel, including an 80-inch TV, a new, quiet A/C system, a top-of-line Talalay natural latex/Energex bounce memory foam mattress in the master stateroom, and cutting edge galley equipment, M/Y USHER is refreshed, improved and ready to fulfill charter wishes. 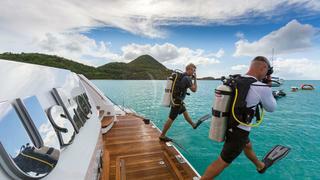 Superyacht USHER carries 12 crewmembers, including a video and photo pro to help create lasting memories of your charter. 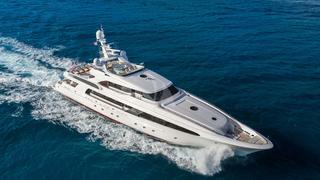 Charter Motor Yacht USHER for an unforgettable experience.